Spanish Doors, is a bright and delicious, heart-warming novel by Diana Renfro that seeks to speak to women who have been challenged in their father-daughter relationship and to anyone who wishes they could learn more about their own family. During Arden’s pilgrimage to Spain she uncovers her family’s biggest mystery, one that only begins to solve the questions of Arden’s past. With heaping portions of good food, goods wine, and beautiful far-off lands Diana Renfro's debut novel, Spanish Doors, is sure to leave you hungering for the next course. Like all good Southern writers, Renfro writes with a strong sense of place where tantalizing food is on the table and there's plenty of good wine for everyone. She's also one heck of a storyteller. Jump in and join in the preparations of a Feast inspired by her novel, Spanish Doors. Register Now - limited spots available. This class begins at 6 pm and is perfect for anyone of any culinary skill level and who loves spending the evening among fellow travelers! 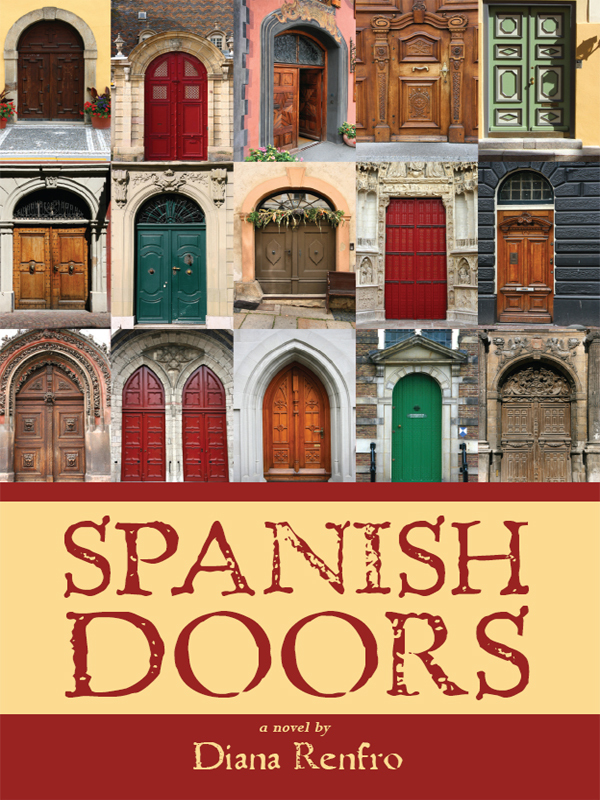 Please read her answers to a few questions concerning how she arrived at SPANISH DOORS and how she opened them! 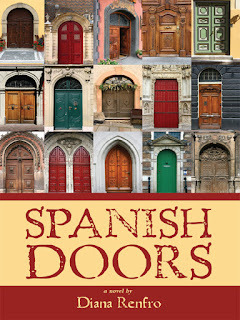 Spanish Doors will be available for purchase at the January 13th class and it is also available here. Follow Diana Renfro at www.ramblingsfromgrassycreek.blogspot.com - Diana lives on a forty acre farm in Grassy Creek, North Carolina where she gardens and nurtures the creative spirit with her husband, two rat terriers, and a cat. Visit Diana Renfro at www.nuthousecottage.com - nestled on her 40 acre farm, this cottage has many essences of Spain and is a most perfect retreat for any and all writers. Now then here's Planting Cabbages interview with Diana. Muchos Gracias! Diana Renfro: We lost a child in 1981 and I began to write as a way to talk to myself and God about what happened, to try to understand, and eventually heal. At first, I just recorded what happened, then I began to ask questions and eventually, the writing turned to art: poetry, and fiction. My first published short-story was from a man's point of view which I wrote because men and women grieve so differently. Finally, I could go on to writing other stories, almost always about women and their relationships. DR: My formal training was in Nutrition and Foods, so most of what I read was science until I got out of school. I think the first thing I read for fun after that was Annie Dillard's, Pilgrim at Tinker Creek. Her descriptions of the natural world impressed me with the fact that science didn't have to be didactic and opened my eyes to seeing the world in a new way. I liked Hawaii, by James Michener, and the idea of telling stories to illustrate other cultures-anthropology made fun. Gail Sheehy's book, Passages, helped me see life as a journey and the necessity of relationships to personal development. (I could go on and on…) Now, I read what the book club is reading because I love a discussion and if I get more than one recommendation for any book, I will read that one right away. I am still catching up on the classics I wasn't required to read studying science. This year, I enjoyed, The Sound and The Fury, by William Faulkner. DR: Everyday life is the medium with which I work. It is the clay, the paint, the fabric I use to shape, color, cut and piece a story. Paying attention is essential. DR: Wasn't there a time when all writers, in English, were men? Women writers started and fueled the Women's Movement of the last century. As life becomes global in this century, we Americans need to open ourselves to other cultures, other ways of experiencing life. I like reading about life in India or Tehran. I like writing about North Carolina and Spain. DR: Distractions and tangents make me crazy. When I'm working, I have to let the phone ring and go to voicemail because if I answer, one thing will lead to another and I'll go off and do something else. If I have to research something, the same thing can happen, I get off on an interesting tangent. Discipline is the hardest part. Then there are times when the writing is fun and times when it is hard work. I can get lost in my work during the creative phase, making up the story, but then bogged down in the re-writes and the cut and paste work that makes the story flow. DR: The research is always fun to me. If I get an idea, say, to write about a potter, then I will study pottery and clay work and try to learn enough to write it correctly and realistically. This part of writing takes the most time, so it's a good thing I enjoy it. I also read a lot about life as a spiritual journey in books like, The Heroine's Journey by Maureen Murdock and The Soul's Code, In Search of Character and Calling by James Hillman, and about the healing power of stories in books like, Women Who Run with the Wolves by Clarissa Pinkola Estes and Kitchen Table Wisdom by Rachel Naomi Remen, M.D. I'm always reading something about wellness and wholeness, trying to get there. DR: Spanish Doors is general fiction, but women's fiction more specifically because it has to have a pigeon-hole, but that doesn't mean men don't like it. They do. I have written poetry, long and short fiction, and non-fiction, and it's always about women and their relationships and the places I love with food and health thrown in as necessities for a good life. My blog,http://www.ramblingsfromgrassycreek.blogspot.com speaks to these themes as well. I didn't come up with a brand that would determine what I would write. It's the other way around. What I write creates a brand. If I wanted to change genres, I would use a pseudonym. PC: What is the current state of American fiction, as you see it? DR: I hope fiction is going global like everything else. For my blog, for example, I know I have readers in Russia. Also, short is good, a quick read on the iphone reaches more people than hardback novels. Instant gratification meets the basic human condition. DR: I recently heard a futurist say, "Everyone over-estimates the amount of change that will happen in the next 2 years and underestimates the amount of change that will happen in the next ten years." I'm guessing I don't have a clue what will happen next. I'm hoping for something like, "Beam me up, Scottie," and downloading information directly to the human brain. DR: Telling stories has always been a very human way of teaching and preserving culture. Today, we are hearing (and seeing in movies) more stories about other cultures. If I get to know a character who is different from me but still so very human like me, then I can feel his life and culture and recognize that his basic needs are the same as mine. Before we can find peace, we may have to learn how much alike we are as humans and how to see past our differences.